There’s something nostalgic about Betsey Johnson to me. You see, almost 10 years ago, a girl was having a horrible time finding a prom dress. All the dresses she saw were too long, too sparkly, had too many sequins, or showed off too much of her “assets,” if you get my drift. And if you haven’t figured it out by now, that girl was me. Finally, after many failed attempts at dress shopping, I stumbled into the Betsey Johnson store in Downtown Seattle, picked up two dresses, tried them on, and I fell in love with one of them. The only problem? The one I fell for was $450. Wayyy more than my Mom wanted to spend. But a few promises to work off my overspending and a lot of groveling later, it was on, and I had my dress. I was reminded of my love for Betsey Johnson when I saw the new KLEENEX® Betsey Styled Single Packs (74ct.) and KLEENEX® Betsey Styled Wallet 3 Packs in my local QFC. Yes, I’m talking about tissue. But sometimes it’s about the simple things in life, like a dressed up tissue box. I know it sounds a little silly, but it was just the pop of fun decor I needed in our bathroom. 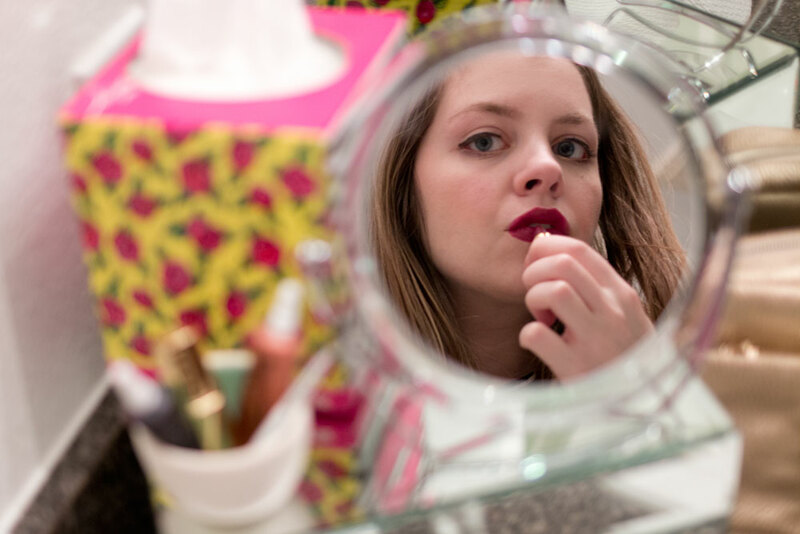 The bright colors, silly kissy lips, and pretty flowers updated mini “vanity”. One of the downsides of condo life for me is having one sink and a vanity I have to share, so I make it work by using my jewelry box as a stand for my makeup mirror. I’ve lamented about the lack of space in our condo before. Our bathroom happens to be one area where I wish I had more space. I may or may not be a slight makeup hoarder, and it’s hard to be able to display my collection let alone have enough space to have a full vanity to myself. 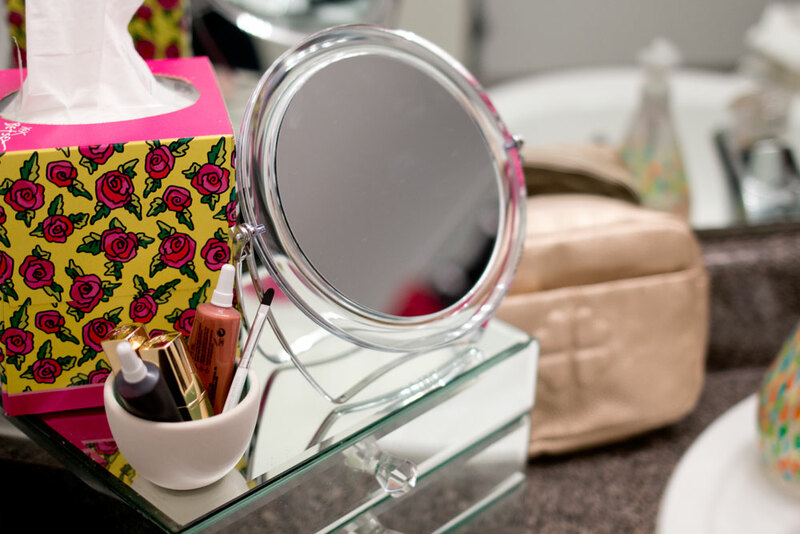 When I saw the KLEENEX® Betsey Styled Single Packs, I knew this would be the perfect way to “dress” up my vanity. (Get it? 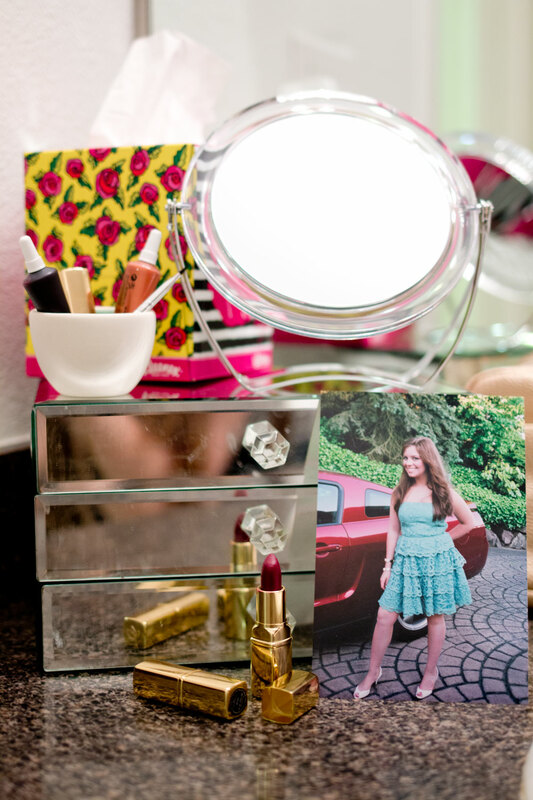 ;) )The pop of color adds something special and sentimental to my updated mini “vanity”. Using my jewelry box as my vanity “stand” I added this new makeup mirror, and I added a couple of these dishes to hold small odds and ends. Right now, I’m using them for lipsticks, but I plan on storing rings and bobby pins in them too. The nice thing about this “stand” set up is I can take it with me when I film makeup videos and it can transport to any table in our house. *Available in select Kroger and Kroger banner stores. Purchase two specially marked packages of Kleenex® Tissues in one transaction at Kroger stores and receive a reward code valid for a $5 Visa Digital Rewards Virtual Account via text message between 4/1/15 – 4/30/15. Reward code must be activated by 5/31/15 and is void if not activated by the expiration date. Virtual Account expires 2 months from the date of activation and will be void if not used by the expiration date. Virtual Account can be used online wherever Visa debit is accepted for digital content purchase(s) up to $5 and use governed by terms in Account Holder Agreement: https://www.activaterewards.com/Kleenex/terms_and_conditions. Digital content may not be available for all devices. No cash value. Not for resale; void if sold or exchanged. Cannot be replaced if lost or stolen. Not valid with any other offer. Offer and Virtual Account valid only in the U.S., excluding U.S. territories. For full participation instructions, go to www.activaterewards.com/Kleenex. Issued by MetaBank®, Member FDIC, pursuant to a license from Visa U.S.A. Inc. Digital Reward is powered by Fandango Loyalty Solutions, LLC. ©2015 Fandango Loyalty Solutions, LLC. All Rights Reserved. 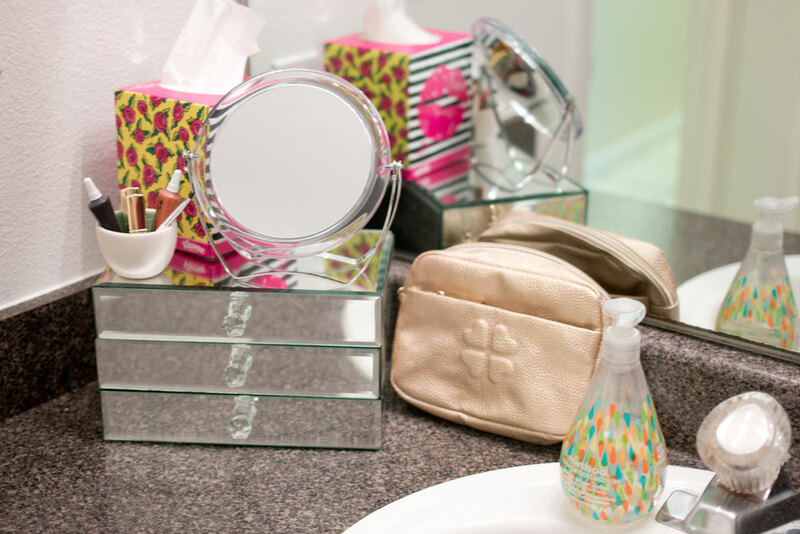 If you’re thinking about giving your bathroom a little “makeover” for spring too, you can find even more inspiration from KLEENEX® at http://cbi.as/5doi! 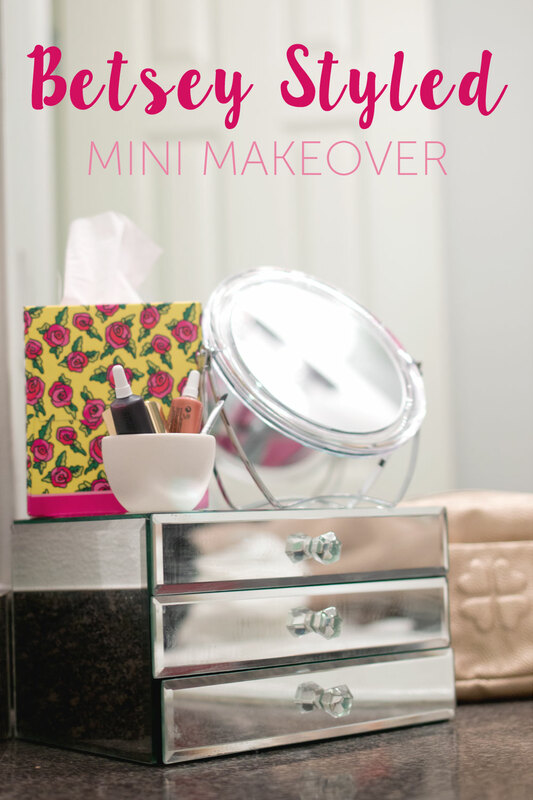 What do you think about my mini makeover? I love almost everything by Betsey Johnson! I had no idea they had Kleenex boxes styled with her designs. I may have to hunt them down and surprise my best friends with them (she has a cold). I always make her cheesy “get well” bags. lol! Was wearing a Betsey Johnson dress the day I found out I was pregnant. She is so amazing lol. Aw! That’s so sweet, what a lovely memory! I just gave my bathroom a makeover too! Gotta have the good tissues. Because I’ve bought a couple of boxes of the not so good ones, and man… they’re quite rough on the poor’ ol schnozz. Oh no kidding, the worst is using toilet paper while you’re sick – I always end up with a cracked, dry nose! Those tissue boxes are so cute. I love Betsey Johnson as well and have a purse by Betsey Johnson that I’ve been using and getting so many comments on as well. I will have to pick up some of these tissue boxes. What a nice pop of color this adds;) I think we all had “one of those dresses” that we fought so hard to get! Aw, thanks Cat! I think so too – the colors are so fun and love the feminine/edgy style too! These are so cute! I wish they were available around here. They really are cute, and thanks Lisa! Thrift store finds are the best, sounds like you scored! I love the colors! Cute! So cute… It’s allergy season in my house. We are always stocked in the Spring. Look at teenage you! Love it!! :). Betsey Johnson has such a fun style. There was a dress I lusted after for a couple of years but never bought :(. At least this Kleenex is a little more in my budget! I love all things Betsey Johson, she has a retro & fun style that speaks to all of us! Your bathroom looks fab btw, the pop of color via the styled pack is a wonderful addition to your room! can we talk about how cute 18 year old Jenn is? I do love that that dress. clearly your sense of fashion started early. and how awesome is that Betsy Johnson Kleenex?? love!! Aw, thanks Melissa! I’ve always been a bit fashion obsessed! And yes, aren’t the boxes just so cute? I can’t get over it. So cute! It’s amazing how much a little makeover makes a big difference! Thanks Katie! It really is! Jenn, what a cute bathroom makeover. It’s affordable, practical, and like you said, adds a fun pop of color. I have never seen these before but will keep my eye open for them now.